Teaching can be an amazing job. It can also be an exhausting job and a thankless job. When you are burning the candle at both ends, you can quickly run out of fuel. Keep the workplace fun! Earlier this year my classroom flooded. Twice. It wasn’t terrible, but the water was definitely there. Two of my grade level colleagues began telling the students they were jealous of my “water front property”, but worried about the “Wetlands” in my classroom because the water quickly vanished from the floors. 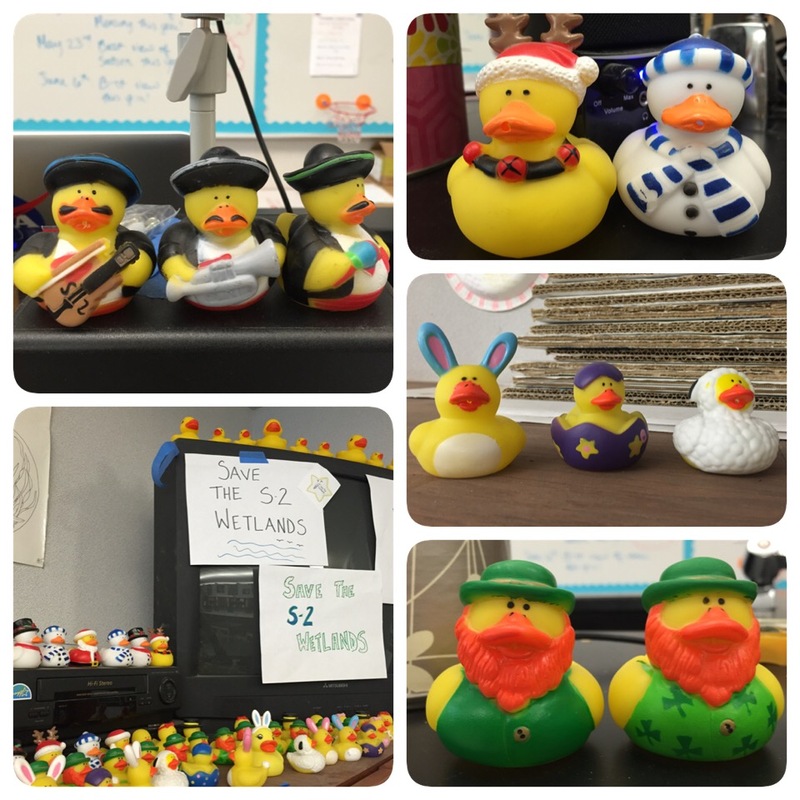 Since then, I have continuously come into my classroom around various holidays to find at least a dozen themed rubber ducks scattered around my room with signs saying to “save the wetlands”. It turned an overwhelming situation into something fun that I now look forward to. The students have also gotten involved in the ducks and we all get a kick out of it. Take care of yourself! You are the most important person to take care of in your classroom. You are the deciding factor on how the day will go with your students. If you are in a bad place, your students will be in a bad place as well (and we all know how unpleasant teenagers can be when they are upset). In order to make sure you are in a good place, be sure to read my blog post here for more ideas on self-care tips. Do NOT check your work email at home. The times where I have seen my co-workers and teacher friends get the most upset is when they have been at home, trying to relax and they get an email that they feel the need to reply to immediately or if they get an upsetting email from someone. When you check your email at home, you can easily get wrapped up in work when you should be at home recharging your proverbial battery. To avoid these things from happening, I ONLY check my email when I am at work. This way, whatever work-related situation needs to be handled can be dealt with at work with the support of my colleagues. I have never had a situation where there was an email that I needed to respond to while at home. Honestly, no matter how important the message is– for the price of your sanity and peace of mind: it can wait! Don’t over-commit yourself. I will be one of the first people to encourage others to get involved in their school to help build community; it can really help to make your job easier. So, it’s great to get involved, but don’t over do it. If you spread yourself too thin, you may end up in a position where you are not able to give 100% of yourself to the task(s) at hand. I try not to take on more than two or three outside-of-teaching commitments at a time(depending on the time requirements). Trust me, you will be much happier. Avoid getting involved in the negativity. Sometimes the negative-train comes into town and it can be hard not to jump on. Unless you are having discussions to try and correct a problem through open dialogues, try to avoid these conversations. The negative banter and gossip can wear on you and really bring you down, keep it positive, people!! I hope this helps you to stay refreshed as well as avoiding feeling the pangs of burnout on the job. Remember, we are incredibly lucky to be part of the teaching profession and we should always feel lucky. I know that it can seem difficult– especially when people are used to you responding anytime. Maybe next year, you can try it out. Tell the parents on back to school night that you don’t check email from home, but will get back to them as quickly as possible once you’re at work. I hope you’re able to make that jump! Good luck! !